Mesa Reservoir was dry in the 1970s but is now filled with water and birdlife as a result of the Silver Lake Ditch. To get there, take US 36 north to Longhorn Road, which is about two miles north of the intersection of 36 and North Broadway. Turn east and go about a mile to the parking lot and the Boulder Valley Farm Trailhead. 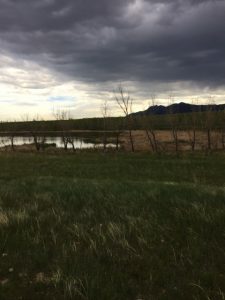 The reservoir is part of the Boulder Open Space and Mountain Parks system and is replenished with Silver Lake Ditch water when direct flow rights are in priority.